For many people, traveling is among the great joys of life. Of course, it’s also expensive and hassle-prone. And if things go really wrong, it can be downright nightmarish. (As happens when you end up in airport security jail because your money belt shows up in the body scanner as you having a bunch of explosives strapped to your waist. But that’s another story.) Tokaido is a board game that seeks to give you the joys of traveling the East Sea Road through Japan while skipping all the hassles, expenses, and aggravation inherent in “real” travel. So is it a nice diversion from your busy life, or is it a journey best skipped? Read on. Tokaido has you journeying along the East Sea Road, collecting souvenirs, eating fabulous food, seeing the sights, and meeting new people. Your goal is to finish the game as the traveler who saw and did the most interesting and varied things. 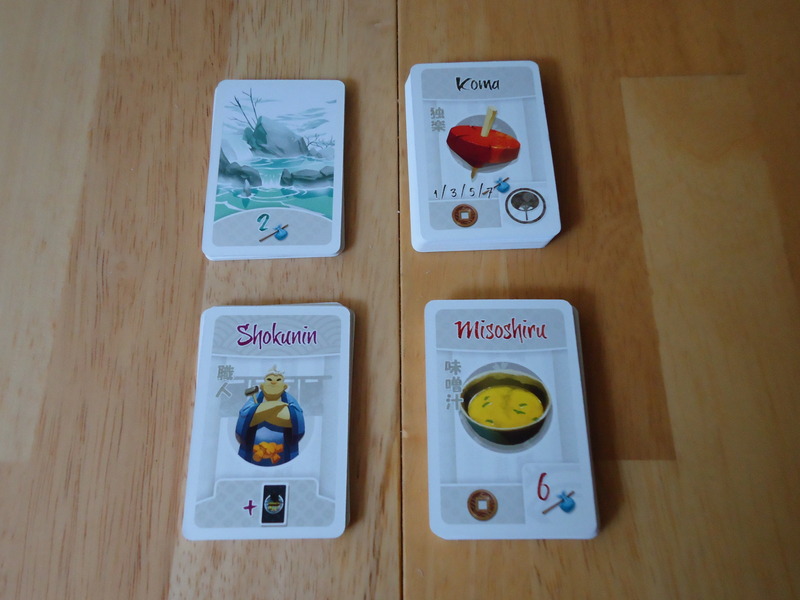 Turn order in Tokaido is determined by who is currently the last traveler on the road, rather than by going around the table as happens in most games. If your traveler is last, you take your turn. If you pass someone on your turn and leave them in last place, that player takes the next turn. However, if you do not pass someone on your turn and you remain in last place, you get to go again immediately. The Village: This is where you buy your souvenirs, if you can afford them. Souvenirs award victory points individually, but are worth much more if you manage to collect a set. Farm: The Farm gives you three coins to add to your supply. Panorama: A Panorama is made of 3, 4, or 5 sections. Panorama cards are added to your collection in numerical order, beginning with the value 1 card the first time you land on the Panorama space and increasing each subsequent time you land on a Panorama space. Points are awarded equal to the value shown on the card. Hot Springs: You take a Hot Springs card and add its points to your total. Temple: If you donate money to the Temple, you earn one point for each coin donated. Encounters: If you have an Encounter, you take the top card from the Encounter deck and apply its effect immediately. Inns: Everyone must stop at each inn. The first player to stop takes the first space and subsequently arriving travelers form a line behind him. The first player takes the meal cards and decides which one, if any, he wants to purchase and places it in front of him. Meal cards are worth points. Subsequent travelers can choose from the remaining meal cards, so the last arriving traveler has the least choice. Everyone must remain at the inn until all players have arrived. The game ends when all of the travelers have reached the last inn in Edo. In addition to the points scored and recorded along the journey, any earned achievement cards (for having the most of something or being the first to complete a panorama) are handed out to the correct players and points are also awarded to those who were the most generous donors to the temple. The winner is the traveler with the most points. The High Road to Fun or The Low Road to Nowhere? 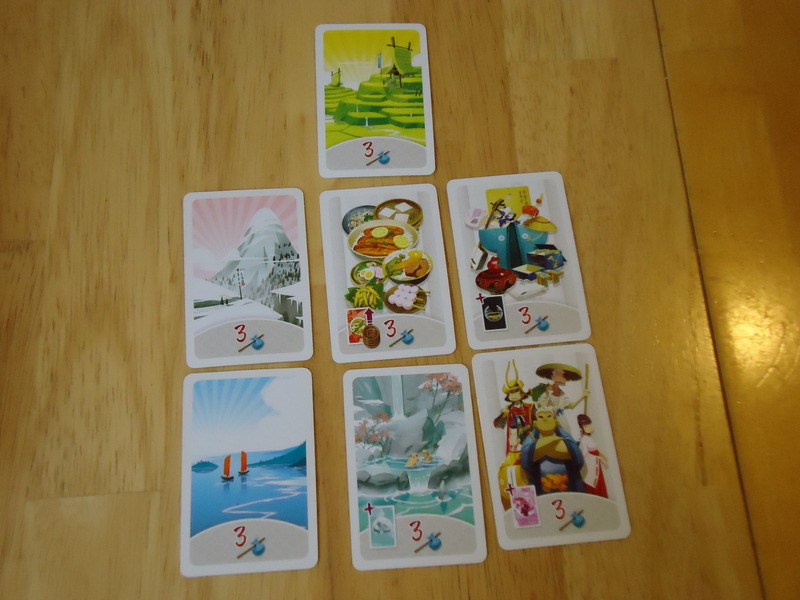 I’ll confess that I bought Tokaido primarily for the artwork. When I saw it I just knew I had to have it. What has surprised me is how much I enjoy the game and how often it hits the table. The greatest strength of the game is its unique and inoffensive theme. It’s a game that I can pull out with almost anyone and they will want to try it. There are no fantasy characters, no horror, no diseases ravaging the planet, no combat. Yet it has a solid and evocative theme, which appeals to people who don’t like abstracts. And it’s different. It’s not one of the many medieval-themed games that, while inoffensive, have overrun the market. It’s a solid choice for those who want a game with theme but who don’t like a lot of what’s on offer in the game market. I’ve heard Tokaido compared to Candy Land for adults, but that’s not really being fair. Sure, movement is simple to understand and you only have one thing you can do on a space, but there are many more nuances than there are in Candy Land. 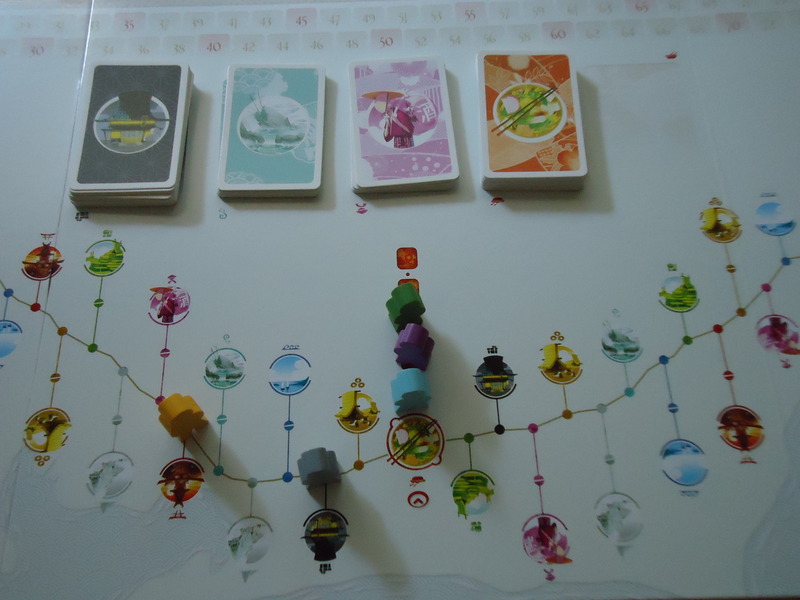 Unlike Candy Land, Tokaido is a game that rewards repeated plays because there are multiple paths to victory. You can focus on collecting certain sets like souvenirs or panoramas and trying to get the most so you get the extra achievement card points, or you can try to get a little of everything and hope that you can pile up enough points that way. Your character card will also give you a special power that will help you maximize your points if you use it wisely (and don’t forget about it). Since there are multiple ways to get points, you’re almost never without a scoring option. Even if you can’t get to your ideal space, chances are you can get some points somewhere. Gamers will focus on optimizing everything, but even non-gamers can stay competitive simply by playing. Some would argue that this is a flaw of the game. If you can score points without really trying, isn’t the game too random and scripted? Doesn’t it rely too much on luck? Admittedly, the game can be random. Almost all of the actions come down to some form of blind card draw or obvious choice. The character you get at the beginning is drawn randomly. Hot Springs and Encounters are random card draws. Souvenirs and meals are chosen from a random set of cards. The spaces you can move to are those that other players aren’t currently occupying. You are never 100% in control of most of your decisions. 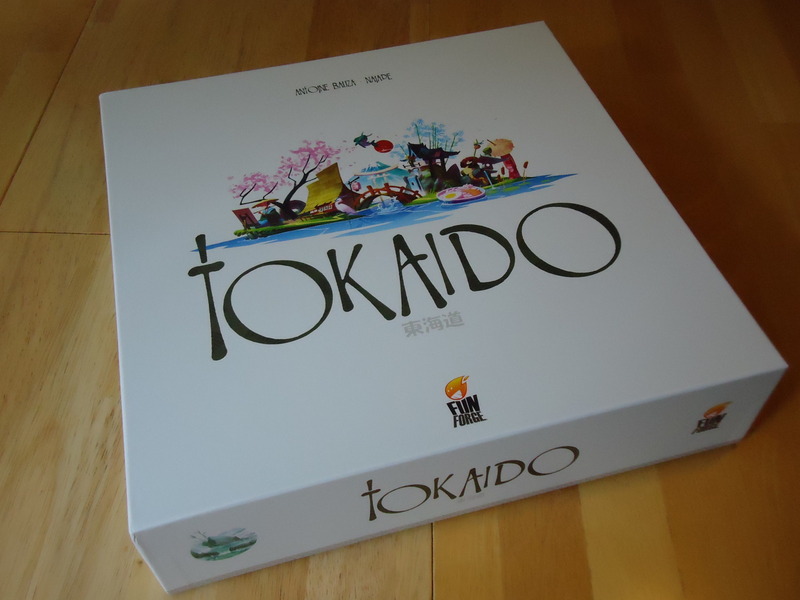 If you need to be in total control, Tokaido is not for you. However, even with the randomness there are strategies and tactics you can employ. As noted above, you can try to focus your point gathering on two or three avenues that are most profitable and use your character card power to pile up even more points. You can also try to mess with your opponents. A lot of the push-pull in the game comes from the fact that you can’t occupy the same space as another player. This makes it possible to block what you think another player needs or force someone further down the path than they might wish, making them miss out on several point opportunities. This works better (from a strategy standpoint) at lower player counts. (The two player version uses a dummy player to take up an additional space on the board and provide more tactical choices.) Do you try to block something your opponent needs, or do you go straight for something you need? How far do you move forward? Do you try to “get clear” by getting way ahead of your opponent and hope that you can gobble up the points out in front, or do you stay close and hope that your opponent doesn’t take what you need before you can get it? Since we play mostly two player, I was happy to see that it becomes more of a gamer’s game at lower player counts. The tactics are still pretty strong at three players, but once you get to four things start to get more chaotic. If you get three or four players lined up, the player in last place is going to have to skip a whole lot. There will likely be only one or two spaces that he can get to without getting too far ahead and missing a lot of points. This doesn’t give you a lot of choices or strategy, beyond taking the best of the options for yourself, or blocking an obvious high score for an opponent. Of course, all players will likely have the same problem, so it becomes a game of minimizing damage and making the most of the one or two options you do get. Even if you choose to really go at each other and block aggressively, the game never really feels nasty. It doesn’t even feel that competitive. You really do feel that you are simply out to have a good journey and winning, if it happens, is just a nice bonus. Even if you lose, you end up feeling like you’ve had a good time. (Unless you’re playing this way too competitively or you’re a sore loser in general.) You got to see some neat stuff, meet some cool people, and eat some good food. This makes it great if you don’t quite want to play a co-op, but neither do you want to alienate your group with a hostile game. Aside from the randomness mentioned above, the other big negative of the game is that some will find it lacking in replayability. Once you’ve been down the path a few times it starts to feel like the same thing over and over again. This is mitigated somewhat by the character cards which give you a different power every game. With ten different characters, it will take a while to play with all of their abilities and the associated strategies. But it will happen eventually. While I find value in simply playing the game for the sense of peace it gives me after a hard day, people who are always looking for a challenge or a different strategy to try will get bored sooner rather than later. If you can enjoy it as a Zen experience, you’ll get more mileage out of it than if you’re playing it as a competitive game. 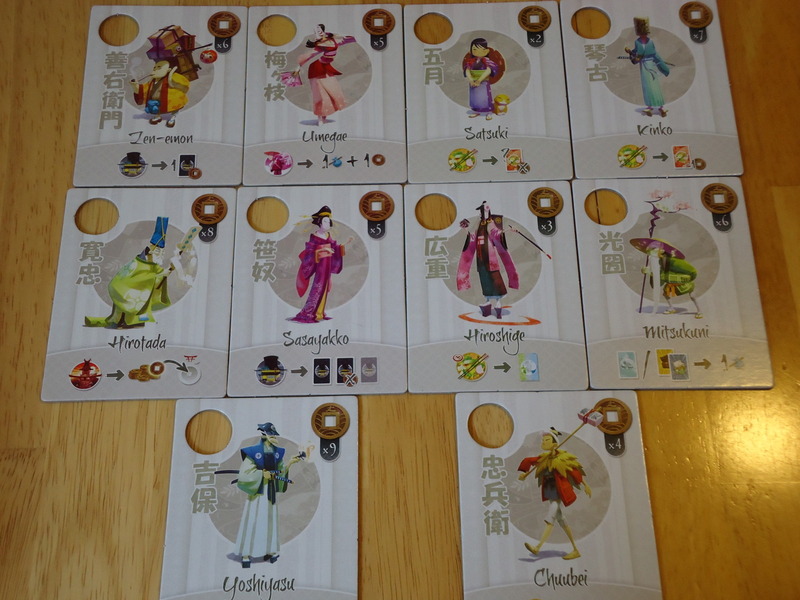 Tokaido is an interesting game and unlike anything else in my collection. It manages to be competitive, yet peaceful; simple, yet challenging enough to keep it interesting. I’ve found it to be a good gateway game and something that most people are willing to play based on the artwork alone. Would I buy it if I wanted a difficult, challenging, competitive gaming experience? No. That’s not what Tokaido is. It’s a lightweight game that manages to be as much an experience as a game. If you want something very different from most other games, something to draw in non-gamers, or something to relax your brain and make you say, “I had fun even though I didn’t win,” Tokaido is a good choice. Ease of play and inoffensive theme make it perfect for non-gamers. Lovely artwork and minimalist style creates a very peaceful experience. Although it's a competitive game, winning often feels secondary to the experience. Not a very vicious game, although there are ways to block your opponents from getting what they need. Just enough decisions to make to keep it interesting without being overwhelming. Gamers will lament the lack of depth and strategy. While there are decisions to make, most feel kind of obvious. The game can feel random with blind card draws determining many of the actions. Gamers may find that it gets stale quickly.